On Saturday morning, Apple launched the iPad, which in Europe would be quite a small thing, only important to techies and geeks. Not so in New York. It made the cover of Newsweek, TIME magazine, and the New York Times every single day that I was there. 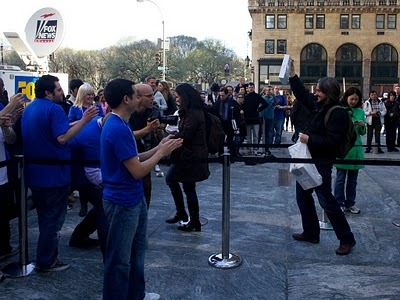 At quarter past eight, forty minutes before opening time and official launch, the whole plaza in front of Apple's Fifth Avenue store was already crowded. 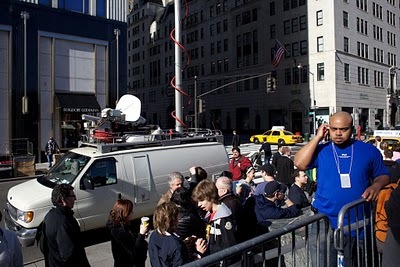 A dozen news vans were parked in front. 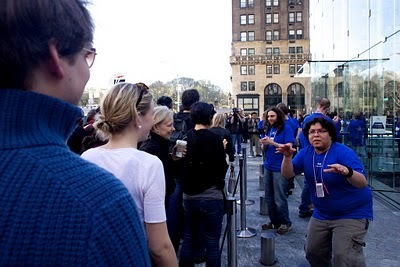 About two hundred people were standing in line, which made absolutely no sense because Apple had taken reservations, so the only benefit you got from being among the first people inside the store was the ability to brag that you were among the first people inside the store. I had breakfast and came back at five to nine. The line had more than doubled and was overflowing onto the sidewalk. 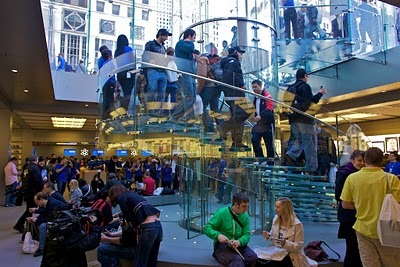 Apple employees were being scolded by other shops' security guards because they were about to open and the fanboys were blocking their door. This was something I would eventually get used to: for the next three days, I couldn't use the iPad anywhere without someone joining me, asking me how I liked it, and telling me they were thinking of getting one. And I mean everywhere, not just the Starbucks facing the Apple Store, but the sushi bar in Greenwich and the burger joint and the pakistani deli and the coffee place in Brooklyn. I read in USA Today that on Fifth Avenue a few people started queuing up Friday at 4PM and waited there for seventeen hours just to be among the first to enter the store. That's not too surprising: in a city of 20 million there's bound to be a few nuts. What startled me was that everybody knew about the launch, and most actually cared. 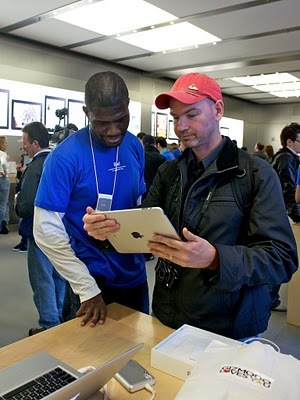 Apparently all New Yorkers are gadget freaks, and mostly Apple freaks at that. From what I can tell, there are more iPhones and Droids and NexusOnes on the streets of New York than in a European web entrepreneurs' meeting. I bet the iPhone has a bigger market share in NY right now than Nokia ever had anywhere. 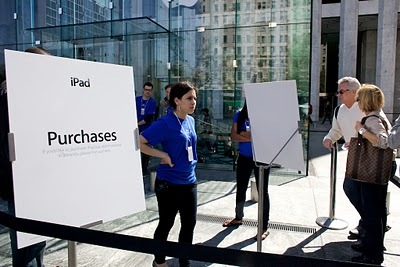 At noon on easter sunday, 28 hours after the iPad launch, there was still a sizable queue at the entrance of the Apple store. It had long since ran out of iPads, but apparently there still wasn't enough room inside for all the people whose only desire on this glorious, absolutely perfect, sunny holiday was to bury themselves underground and try out a device they could not even buy for the next few weeks. People are weird sometimes.